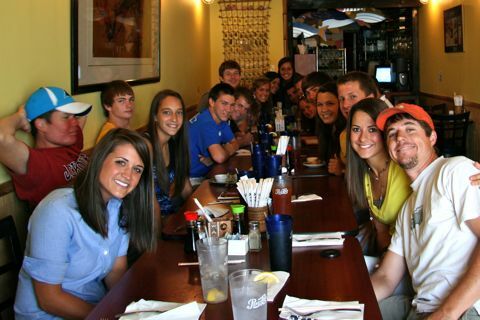 TWB Trek 1's first reunion...the Mooresville crowd met at Joel's for lunch and then headed to the movies together. �Teens Westward Bound is a gift; a gift that should be extremely cherished. I�m so thankful for Dennis Deaton who made this possible and all the others who paved the way as well. I�ll never forget the memories I have made or the sights I have seen; but most of all, I will never forget the people I have met and the bonds I have made. TWB friendships will last a lifetime. I mean, what do you expect when you spend 23 days on a bus with 81 other teenagers? Only good things can come out of that, right? �T-dub is completely indescribable. It is just one of those things you have to experience for yourself. It has definitely changed my life in so many ways. I appreciate life and every day so much more now. And I�m coming out of this with life long friends. Every aspect of TWB is excellent. �TWB is an experience that brings you closer to 81 people than you could possibly imagine. It helps teach you life skills and will be something that can never be forgotten�.